BELGRADE/SARAJEVO – The 4th Annual Meeting of the Regional Cooperation Council (RCC) endorsed in Belgrade today the Annual Report of the organization’s Secretary General and the nomination of Goran Svilanovic as the next RCC Secretary General for a three-year period, effective as of 1 January 2013. The meeting, co-chaired by the RCC Secretary General Hido Biscevic and Serbian Foreign Ministry State Secretary Ivan Mrkic, on behalf of the current chair of the South-East European Cooperation Process (SEECP), discussed developments in regional cooperation in South East Europe (SEE) within the RCC framework, as well as challenges ahead of the organization. The Annual Meeting participants thanked the incumbent RCC Secretary General Biscevic for his important contribution to fostering regional cooperation in South East Europe over the past almost five years of his tenure as the first RCC Secretary General. While presenting the Annual Report, Secretary General Biscevic said that the RCC Secretariat worked for the common benefit of the region on an all-inclusive platform for cooperation, despite remaining unresolved issues in many parts of South East Europe. Secretary General Biscevic congratulated Goran Svilanovic on the appointment as the next RCC Secretary General and wished him every success in his future work. He expressed readiness to assist the incoming Secretary General during the transition period, to ensure a smooth transfer of duties. The RCC Secretary General thanked the Serbian Chair and all the RCC members for their support and contribution to enhancing regional cooperation in SEE through the RCC over the past five years. State Secretary Mrkic expressed high appreciation for RCC’s engagement in positioning South East Europe in relation to EU institutions and in forming a positive image of the region as a whole. During the meeting, the Deputy RCC Secretary General Jelica Minic presented the Secretariat’s Self-assessment Report on the first year of implementation of the RCC Strategy and Work Programme 2011-2013. 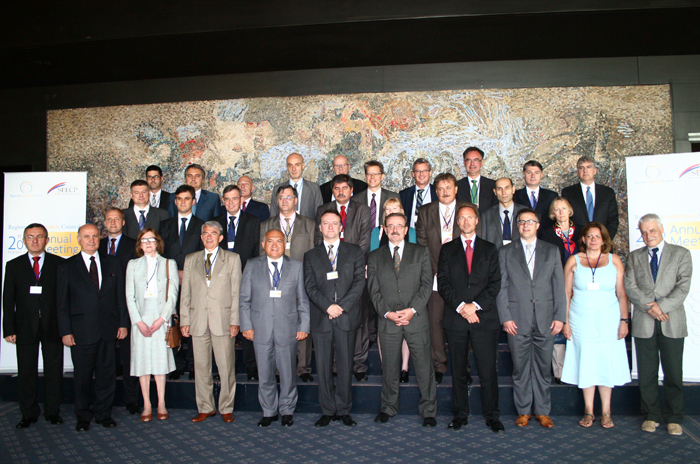 The Annual Meeting was co-organized by the SEECP Chairmanship-in-Office of Serbia and the RCC Secretariat. It is held back to back with the SEECP Summit, and meets at the level of Senior Civil Servants or above. It ensures the strategic co-ordination and development of regional cooperation processes, reviews and endorses the organization’s strategy and the Secretary General’s Annual Report on regional cooperation. For further information, please see the 2011-2012 Annual Report of the RCC Secretary General on regional cooperation in South East Europe and the RCC Strategy and Work Programme for 2011-2013, as well as Annual Meeting materials (introductory speeches, agenda, programme, list of participants, etc. ).